Elizabeth Carlisle was born on January 28, 18961 in Manchester, England to James Carlisle and Mary Ellen Carlisle (née Cottingham). Elsie was not the only member of her family to show a knack for show business; her brothers James (“Jim”) and Albert (“Tim”) were both singers who worked with the great composer, publisher, and impresario Lawrence Wright. 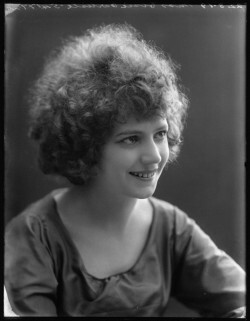 By her own account, Elsie was encouraged to learn singing by her mother, who paid for her to have lessons when she was only a small girl.2 It was her brother Jim who got her her first theatrical role at the age of 12,3 and by the time of her marriage in 1914 she could be described as a “musical hall artiste” on the wedding certificate. By 1919 she was appearing in the West End in a show whose cast included Betty Bolton, and the next year she merited her own show, entitled Elsie Carlisle – With a Different Style, in which she performed as a solo vocalist. How “different” her style was would quickly be made known to larger and larger audiences. Her stage career grew, only to be eclipsed, starting in 1926, by her broadcasting and recording efforts. Elsie’s 38 recordings made with Ambrose and His Orchestra between 1932 and 1935 are among the best remembered, but one should remember that she made at least 342 recordings between 1926 and 1942 — a prolific output. The British public would have known her better still from her broadcasts on the BBC and Radio Luxembourg. She was often billed as the “Idol of the Radio,” a well-earned epithet. By the mid-1930s she was ranked amongst the top vocalists who could be heard on the British airwaves, and she had film and television credits to her name as well. Her dulcet delivery of themes both comic and plaintive continues to attract listeners over a century after her first performance in a Manchester music hall, and the world is much richer for her having lived in it. Cartoon of Elsie Carlisle in “The Encore” (February 18, 1926, three months before she began her recording career). The reverse of this postcard mentions Ambrose, so it can be no earlier than 1932, but the original photograph of which it is a tinted version was taken around 1926.